Since the beginning of online betting, no one company has shaped the market more than Betfair, whose person-to-person betting exchange has revolutionised the way we bet on sporting events. Now a worldwide company, with strong liquidity in its exchange markets and a newly-launched casino platform, it is only natural to expect Betfair to have a high quality poker client. Betfair Poker does not disappoint at all. Although Betfair Poker was established in 2001, today's client is very different from the independent poker room that began 12 years ago. Now teamed with poker software superpower iPoker, Betfair Poker benefits from stronger reliability and a cleaner design. Betfair Poker's presence in the worldwide poker industry has grown exponentially in recent years. With a team of sponsored poker pros that once featured WSOP Europe winner Annette Obrestad, Betfair have sponsored many major live poker events. 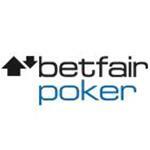 Most recently, Betfair Poker sponsored the WSOP Europe. In spite of clean and reliable software, Betfair Poker's interface is not among the most exciting. Perhaps this is due to the proliferation of iPoker clients among bookmaker-branded poker rooms - leading to a rather generic look and feel. Betfair Poker features the typical spread of iPoker games, including a wide variety of Hold'em, Pot Limit Omaha and Stud cash games and SNG tournaments. In addition to these are anonymous tables, where players can enjoy a secret poker experience and play without being tracked or followed by others. Betfair Poker also embrace the new trend in online poker by including Speed Poker tournaments, where one can fold quickly and be moved to a new hand instantly. Navigation is simple in the Betfair Poker lobby. On the left-hand side are a selection of options, allowing a player to choose between cash games, tournaments, SNGs and currently promoted satellites. Beyond this level, clicks open up further options to select your preferred game type. Further filtering can be enabled to select your favoured stake or buy-in level. As a poker room paired with a giant sports betting operation, Betfair Poker typically attracts many players who are chasing sportsbook losses or playing poker beyond their skill and experience level. Consequently, savvy players can exploit Betfair Poker's player population at every level. As is typical with iPoker rooms, Betfair Poker operate the VIP Points reward system. As players pay rake and tournament entry fees, they ascend the VIP reward level - increasing the rate at which points are earned and the exchange rate when swapping points for cash. VIP players are also given freeroll tickets for their continued loyalty to Betfair Poker. New players are given an especially generous $1000 freeroll entry, whilst upper levels gain access to freerolls between $250 and $5000 entries. Betfair Poker run a variety of regular guaranteed tournaments, in addition to satellites to large live events and exclusive prize packages. Betfair Poker's 'How to Play' section gives a basic guide to every type of the game on the poker room. These guides offer very little strategic advice, but are beneficial to new players. The traffic on Betfair Poker fluctuates quite dramatically during a typical day. At low points, numbers can fall as low as 5,000 players, but peak times see as many as 20,000 players populating the Betfair Poker tables. Betfair Poker players have access to the typical array of deposit and withdrawal methods. These include credit/debit cards, PayPal, NETeller, Moneybookers, Western Union, Bank Transfer and Cheque.